There’s one thing about really bad movies. Most of which get lost into oblivion. Many bad Hollywood movies get to be laughing stocks forever. And then there are some that develop a cult following often as audience participation movies. The most legendary is the Rocky Horror Picture Show: the raunchy musical that made no sense and lives on as an audience participation free-for-all. There hasn’t been a movie that could replace the Rocky Horror Picture Show or even rank well with it. There was an attempt from 1995’s Showgirls many years earlier but it didn’t pan out. The latest one to enter the flock is 2003’s The Room. It has developed a huge cult following too. But will it replace the Rocky Horror Picture Show in terms of being an audience participation phenom? The film was written, directed and produced by Tommy Wiseau who also plays the lead character Johnny. The film stars as Johnny comes home to his fiancee Lisa. He’s a successful banker with a loving relationship with Lisa who’s a successful real estate agent. His young friend Denny, an orphaned kid with a troubled upbringing, comes to visit but has to leave because of… you get the idea. After Johnny leaves, we learn Lisa is bored with Johnny and is more interested in Mark, his best friend. Lisa and Mark end up making more than love, so to speak. Lisa’s mother insists that she marries Johnny because of his stability. Later Johnny doesn’t get the promotion promised to him. Johnny later learns of talk from Lisa’s best friend that things aren’t going right and start suspecting things. Johnny soon finds out that Denny has been getting into drugs. Not even Johnny’s friend Peter, a psychologist, can help him with his issues. Finally Johnny’s surprise birthday party happens and the truth comes out. At the end Johnny commits suicide and Mark tells Lisa how selfish she is over Johnny’s dead bloody body. Okay you can draw out your own conclusion through my description of the movie. But the key ingredient towards its awfulness has to be the lines. Laughing moments happen more often than they should. Playing football happens at the most awkward times. ‘Future wife’ is said instead of ‘fiancee.’ “Everything’s going to to be fine” is uttered more often than it should. But the real creme de la creme of lousiness comes with the lines uttered only once: “You’re tearing me apart, Lisa!” “I feel like I’m sitting on an atomic bomb waiting for it to go off.” “Everybody betrayed me! I fed up with the world.” “You betrayed me… you that good… you, you’re just a chicken, chirp-chirp-chirp-chirp, cheep, cheep.” “Why Lisa, why? Please talk to me! Please!” Yeah, that bad. If the bad lines weren’t enough, there were also fight scenes that looked like they weren’t coordinated at all, cinematography that was bad, story lines that made no sense at all, and love-making scenes set to R&B music that came across as cheesy as hell. Even the end scene as people cry over Johnny’s dead body leaves the audience laughing. All this made over a budget of $6,000,000? And to think Tommy first tried to market it as a drama but then marketed it as a black comedy. That adds to its weirdness it’s already garnered. You’d think a movie like that would be too insufferable to watch, right? Well some people somewhere sometime ago turned this into an audience participation movie and that’s where its success came. People dress up as their favorite characters. People throw things around like spoons, food and footballs during certain scenes. People say “Hi…” and “Bye…” whenever a character enters or exits. People hurl insults and lewd comments during the scenes. People shout “Go, go, go!” during the landscape shots. People also reenact the cheesy lines as they come during the movie. It’s a lot like Rocky Horror. Over at the screening I saw at Vancouver’s Rio Theatre, there was one host dressed up as Tommy Wiseau reenacting his voice and holding an impression contest before the movie was aired. The theatre was filled with mostly twentysomethings; some dressed up as the characters. In the end, the movie is not the same without the audience participation. Sure you could watch it alone on your DVD and laugh but it’s not as fun without the crowd. It’s already garnered a cult following in the last few years. Will The Room ever achieve the same cult status as Rocky Horror? I doubt it. It hasn’t stood the test of time that Rocky Horror has. The Room’s test of time is something only the future will tell. 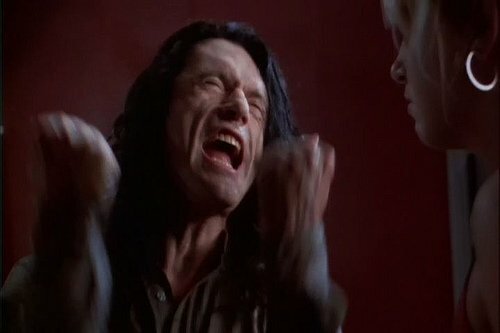 Also while I’ve never heard of any cast or crew from Rocky Horror often showing up at screenings, occasionallyTommy Wiseau will make a guest appearance at certain screenings of The Room. He wasn’t here in Vancouver, at least this time. In conclusion, it’s no wonder that The Room is labeled the Citizen Kane of bad movies. The cult following of audience participation is a celebration of its lousiness and makes for a fun night out at the movies. Prepare to laugh like you never laughed before.